May 25, 2015 May 25, 2015 Nefer Khepri, Ph. D.
Happy World Tarot Day! Contest for 3 Free Readings! 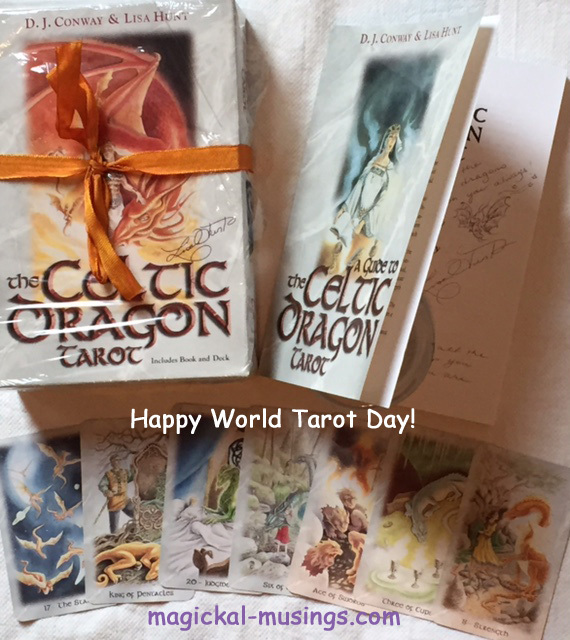 Every World Tarot Day I celebrate by giving myself a lengthy Tarot reading using my all-time favorite deck, The Celtic Dragon Tarot, by Lisa Hunt (Llewellyn Publishing, 1999). I have 4 copies & this one pictured is my pride & joy because the box & book were both signed by Lisa. This is the deck that inspired me to become a deck creator myself & now my Egyptian Lenormand deck is available at Amazon & other booksellers. The Celtic Dragon Tarot, by Lisa Hunt (Llewellyn Publishing, 1999), signed copy. In celebration of World Tarot Day I am offering 3 free tarot readings to 3 randomly chosen followers of my blog. If you’re not already subscribed, please do so & will include you in the drawing. I am holding the drawing tomorrow & the 3 winners will be announced here & also on Facebook. Winners will need to contact me via email to collect their prize. Good luck to all & enjoy today, which is also Memorial Day. Please say a prayer to all who have made the ultimate sacrifice for their country. Thank you!